Located in an historically important 500 year old building which contains remnants of the old city wall, its beamed ceilings and bedroom fireplace are there to welcome you home. 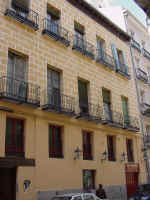 This fifth floor "ático" has views of the roof lines of the oldest part of Madrid of the Austrias. Some of the finest restaurants in Madrid line your street, and most everything you wish to visit is within walking distance! Completely refurbished, it offers all the modern conveniences and air conditioning. There are two singles in the bedroom, a double pull out sofa in the sitting room/kitchen and a double in the loft overhead. 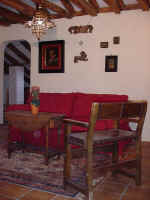 Situated in the quiet Cava Baja street, just yards from the excellent Casa Lucio restaurant and 2 minutes walking distance from Botin and the magnificent Plaza Mayor, you'll be within easy walking distance to all the major historic sites and important museums. For information on transport from the airport, see our Madrid airport transport page. Would you like to rent your apartment here? Contact us! ¿Quieres alquilar tu apartamento aquí?